A very common question directed towards vegans is, “Where do you get your protein?”. The answer may be as simple as plants, but let’s delve a little deeper! I want to start with my personal experience in regards to the misconception of complete proteins . Growing up, I remember combining rice and beans at meals. Despite following a vegetarian diet, I had absolutely no knowledge about nutrition. I ate this way without asking questions. Now surprisingly to me, when I was a sophomore in college, one powerpoint slide in my education and counseling class addressed the importance of consuming plant protein sources together, such as peanut butter and whole wheat bread or rice and beans. I thought I finally understood why rice and beans were a golden combination. If you’re unfamiliar with the theory of protein complementing, let me explain. Protein is composed of amino acids. In total, there are twenty amino acids. Of the twenty amino acids, eleven can be made by our bodies. That leaves nine to be obtained from food. Animal proteins contain all nine essential amino acids, whereas the majority of plant foods do not (some exceptions include soy, buckwheat, and quinoa). The “incomplete protein” myth was accidentally promoted and popularized in the 1971 book, Diet for a Small Planet, by Frances Moore Lappé. Essentially, the author misled readers to believe in order to be a healthy vegetarian or vegan, you must consume a combination of specific plant foods at the same time in order to get all nine essential amino acids in the right amounts. And so commenced the theory of “protein complementing”. For example, wheat is high in the amino acid methionine but low in lysine. 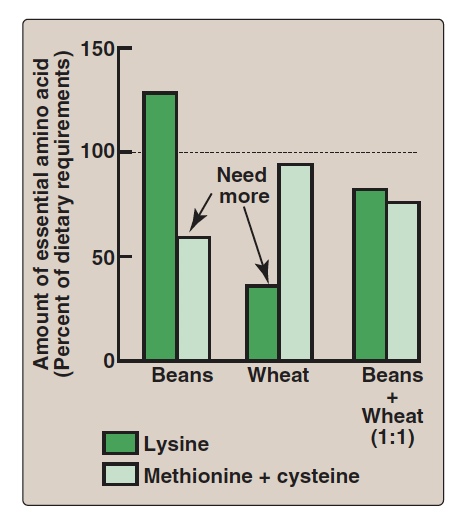 Whereas kidney beans are low in methionine but high in lysine. That’s why rice and beans are said to compliment each other [peep the image below if you’re more of a visual learner!]. I want to emphasize, there is nothing wrong with eating rice and beans or peanut butter and whole wheat bread together. That being said, I believe it is important and perhaps life changing (?!) to learn vegetarians can be healthy without “protein complimenting” at each meal. Fast forward to senior year when I learned my brown rice didn’t need the company of my black beans. I was taking nutritional biochemistry (my hardest yet most rewarding class) and our lecture for the day was about protein. A question pops on the screen, “Do we have to compliment proteins every time we eat?”. Imagine my surprise when I learned we do not! You see, our body has this really, really cool thing called an amino acid pool. This pool is supplied amino acids from three sources— (1) through our diet when protein is broken down (2) through degradation of body proteins (3) our ability to synthesize the non-essential amnio acids and throw them into the pool for when they are needed. Based on individual needs, our bodies are constantly pulling and building protein from this pool. For me, this was a complete game changer. If I, a nutrition major, was unaware protein complimenting was a myth, I imagined there were plenty of others misinformed as well. Now that we know protein complimenting is unnecessary, let’s discuss how much protein we need and specific plant sources. On average, an adult should be consuming about 0.8-1.0 grams per kilogram of body weight per day. To determine how much you need, simply divide your weight in pounds by 2.2, then multiply by 0.8. Here’s an example for someone who weighs 160 pounds: 160 ÷ 2.2 = 73… 73 x 0.8 = ~ 60 to 73 grams of protein per day. During periods of growth, such as infancy, protein requirements increase due to need for building of bones, muscles, and other tissues. For vegan athletes, the recommendations increase with strength training (1.3-1.9 grams per kilogram per day) and endurance sports (1.3-1.5 grams per kilogram per day). Critical illness, disease, and other health aliments also impact how much protein an individual needs. These past few days I’ve been tracking my nutrient intake. To be honest, as I’ve learned more regarding vegan nutrition, protein has become the least of my worries. I easily consumed 133% of my daily needs, or 62 grams. Personally, I love tofu, peas, chickpeas, lentils, oats, flax meal, hemp seeds, pumpkin seeds, walnuts. However, the options are abundant. If you’re not a fan of tofu, try tempeh! If you’re not in love with chickpeas, try black, pinto, white, or kidney beans! Other nuts and seeds with high protein content include sunflower and chia seeds, almonds, hazelnuts, and pistachios. For those curious, I created a visual below which lists grams of protein obtained from some plant sources! Davis B, Melina V. Becoming Vegan: the Complete Reference to Plant-Based Nutrition. Summertown, TN: Book Publishing; 2014. The Myth of Complementary Protein. Forks Over Knives. https://www.forksoverknives.com/the-myth-of-complementary-protein/#gs.w3d3gxpg. Published February 8, 2019. Accessed March 2, 2019. Source: Harvey RA, Ferrier DR. Biochemistry: Lippincotts Illustrated Reviews. Baltimore: Wolters Kluwer/Lippincott Williams & Wilkins; 2011.